Miami’s Grove Central mixed-use complex is optimized for car-free living. In 2018, Miami was named the fifth most congested city in the United States and tenth in the world, according to a study by global analysis firm INRIX. With this dubious distinction, residents spending an average of 64 hours a year sitting in peak traffic are looking to transit-oriented urban development to solve Miami’s traffic problem—and maybe find a new sense of community. 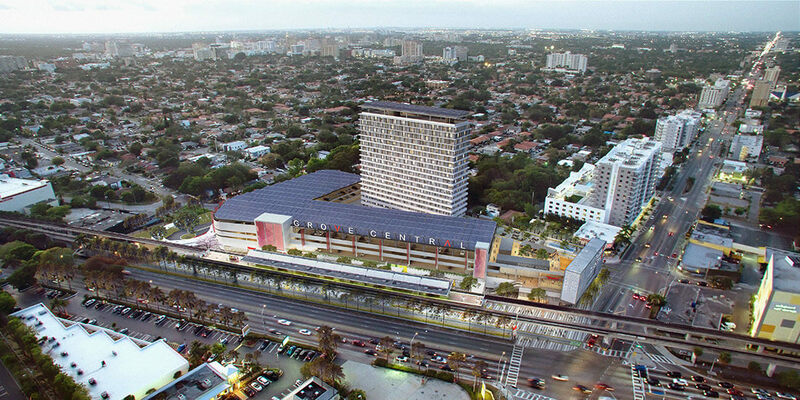 A new development called Grove Central in Miami’s upscale Coconut Grove district is being designed to give residents options to live with less traffic—or without a car altogether—and to address bigger issues such as climate change and high living costs. Developers Terra and Grass River Property and boutique architect Touzet Studio are incorporating transit-oriented sustainable design, energy efficiency, and resiliency in natural disasters such as hurricanes into a unique mixed-use complex housing apartments and retail spaces, which is slated to be complete in late 2021. 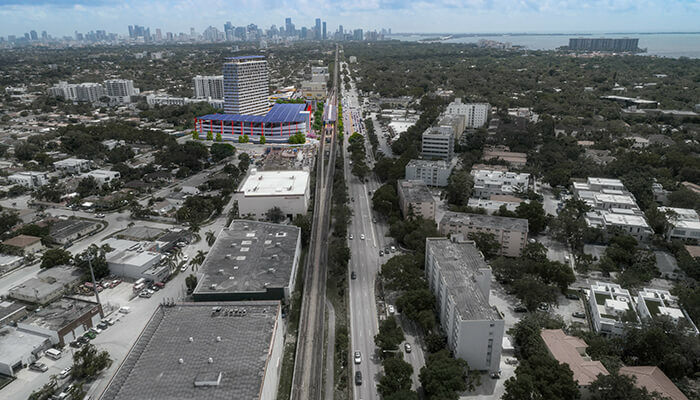 Jacqueline Gonzalez Touzet, principal at Touzet Studio, is excited to see “a new version of Miami where people can live without a car,” something she says was rare five years ago but is now much more common due to ride-share technology and a rising demand for shorter commutes and independence from cars. The development and design team are using two strategies to encourage car-free lifestyles at the complex. The first focuses on on-site amenities such as a grocery store, banking services, a gym, and a pharmacy. The development also includes a rooftop “social hub” that offers areas to cultivate community, including a coffee shop, a cocktail bar, a rooftop lounge, an outdoor movie–screening and event venue, and coworking spaces. A public space in the Grove Central complex. Courtesy Touzet. With all the modes of transportation available to Grove Central, Touzet Studio wanted to understand the user experience from many vantage points. 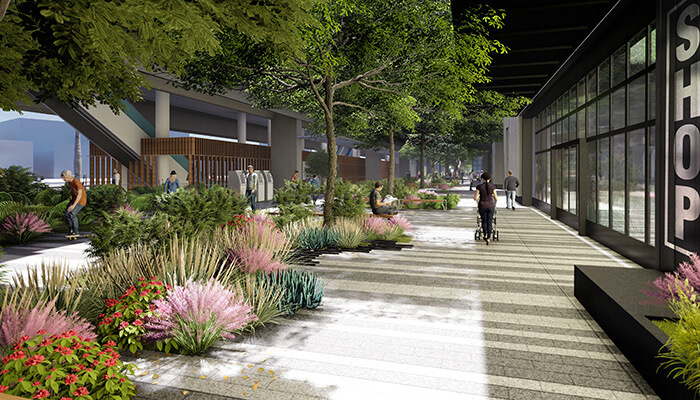 Using Autodesk Revit, the design team modeled the site and building to choreograph approaches from light-rail, via bike, or on foot from the Underline. Decreasing car use means lowering greenhouse-gas emissions. The development and design team also sought sustainability in the design of the building itself. The complex is solar ready, with panels planned for the rooftop of the garage. To reduce the building’s base energy requirements, floor plans take advantage of an energy-efficient facade that comprises just 30 percent glazed openings, decreasing solar heat gain (and hence less energy needed to cool the structure) while allowing plenty of natural light and views. Grove Central will connect to transit heading downtown. Courtesy Touzet. The design team used its Revit model “to facilitate cross-discipline access and analysis by sharing the model of the building and site with the mechanical and electrical engineers as well as the energy-modeling consultant,” Touzet says. Climate change brings more frequent natural disasters, and for Miami, that means more hurricanes. The forecasting website AccuWeather lists Miami as the US city most vulnerable to a hurricane in any given year. With this foreboding forecast, Terra, Grass River, and Touzet took resiliency seriously when designing the complex. “By providing services and amenities such as ATMs, groceries, and pharmacies, which are planned to one day run on solar and battery power when the electrical grid is down, Grove Central is designed to be a hub for the neighborhood to help it return to normalcy more quickly [after a natural disaster],” Touzet says. This functionality will be added in phases: The building won’t have solar panels right away but is designed for them; the site won’t incorporate hurricane-ready batteries right away but is designed with the necessary infrastructure. These batteries could power the apartments and essential commercial spaces if the city’s electrical grid is compromised. “We’re even looking into the possibility of installing enough battery power to power the trains so they could be up and running in a disaster,” Touzet says. These sustainability and resiliency measures at Grove Central will have greater impact if the development is affordable and accessible to a large pool of people. The driving force behind the project was “to fight climate change while keeping it affordable,” Touzet says. The developers are keeping rents down by offering two kinds of units: a microunit and a co-living cluster. The microunits will be available as either 500-square-foot, one-bedroom units or 750-square-foot, two-bedroom units (both considered “micro” by Miami standards). The co-living model is “dorm-style living where a person has his or her own private bed and bathroom, but the dining, kitchen, and living room are shared with four to six other people,” Touzet says. Learn how one Bangkok developer built a live/work community through sustainable innovation. Learn about a Bangkok live/work community built on sustainability. This new wave of urban development in the core of Miami is looking toward the future, adapting to the realities of climate change while also trying to mitigate its effects and creating an affordable and sustainable place for people to live and play.